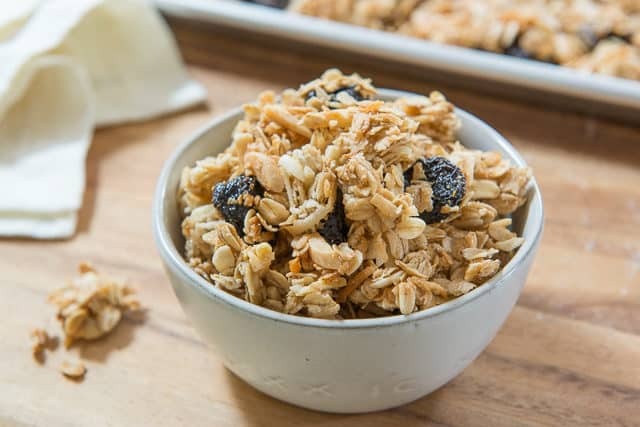 This homemade Granola Recipe tastes so much better than store-bought! Freshness makes all the difference, and you can mix and match with your favorite dried fruits and nuts. 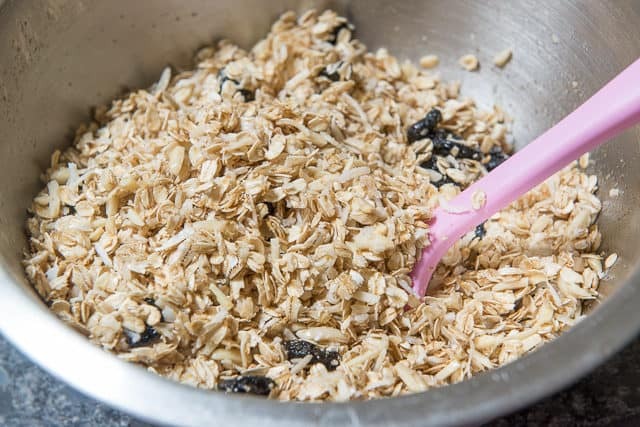 Granola is one of those recipes where once you make it yourself, it’s pretty hard to go back to buying it. It’s SO easy, tastes much better when it’s fresh, and is completely customizable to your tastes. Not only can you play with the mix-ins like the fruits and nuts you use, but you can also make it loose or in clusters. This particular recipe strikes a nice balance between the two, and has both clusters and some loose bits, but I’ll put instructions in the recipe box for how to tweak it to your liking. 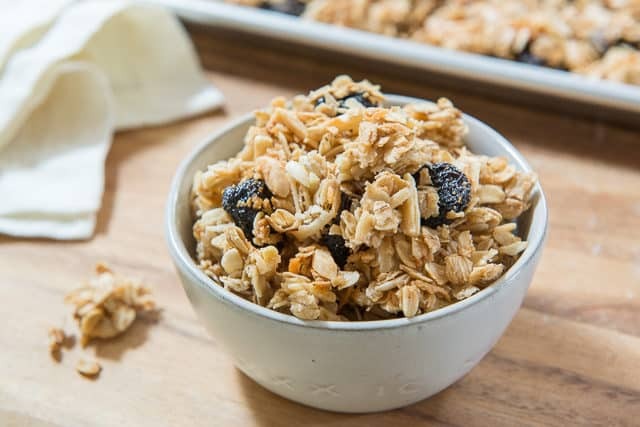 This is the kind of granola that’s perfect for enjoying with a bowl of yogurt or as cereal, but we also keep it around for snacking on the go. If you’re looking for a granola bar instead, I love these Chocolate Chip Granola Bars. 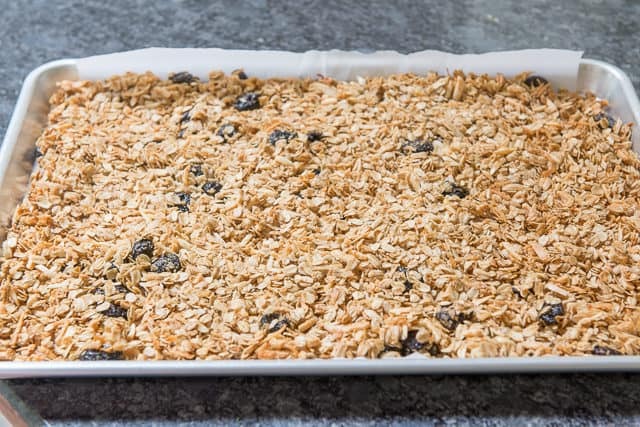 I also have a post on How to Make Granola Bars. This is not an exhaustive list. You could do something like a Peanut Chocolate Chip granola for instance, or do fancy nuts like Brazil Nuts. And again, there’s many more! The sky is the limit. 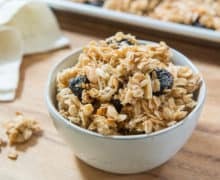 Adding whipped egg white is how to make granola clusters and clumps instead of a loose granola. If you’ve ever noticed whipped egg white in sugared pecan recipes made in the oven, it’s the same principle. The protein in the egg white helps everything stick together better. 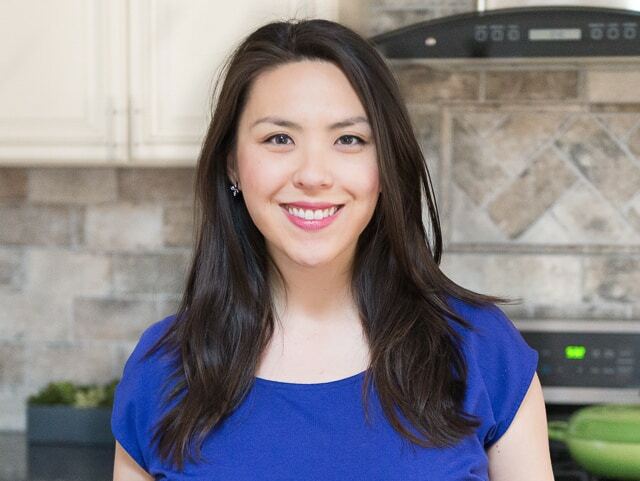 Side note: you can also sub honey or brown rice syrup for the maple syrup for a more clustered-texture, but I like the flavor of maple syrup the best, which is why I use the egg white to bind. The granola will keep at room temperature for at least two weeks. Just make sure to store it in an airtight container, otherwise it will absorb moisture from the air and get soggy. These Raspberry Energy Bites are another favorite on-the-go snack. Enjoy! 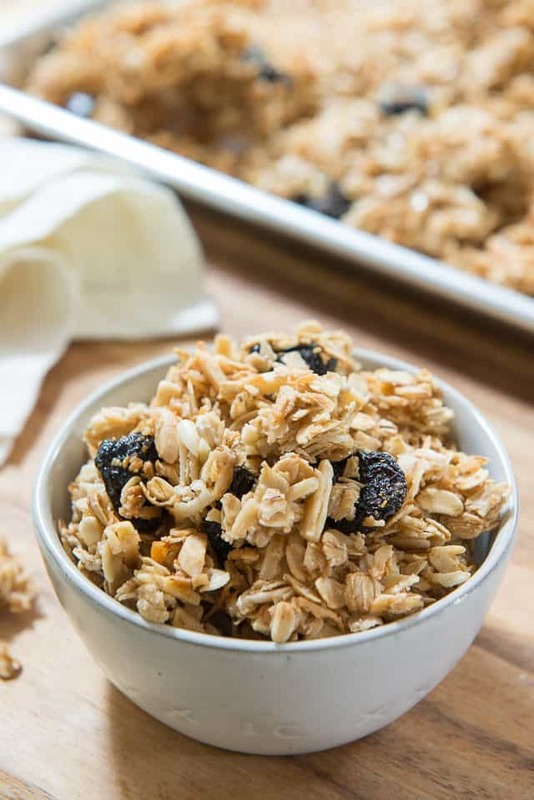 To make this granola vegan, you can leave the egg white out and simply enjoy a loose (non-clustered) style granola, or you can add 1/4 cup brown rice syrup to make it stickier. This granola is gluten-free if you make sure to buy gluten-free oats. In a large bowl, stir to combine the oats, almonds, coconut, cherries, brown sugar, and salt. In a separate bowl, whisk to combine the maple syrup and oil. Pour the liquid into the oat mixture, and toss to coat. 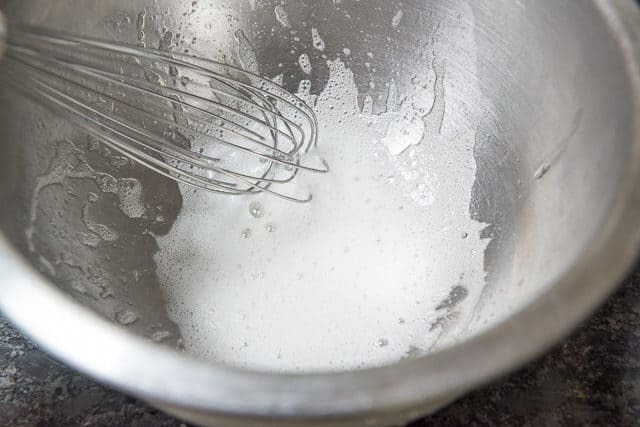 In a clean bowl, whisk the egg white for about 30 seconds until it's frothy, and any egg white clumps have been broken up. Stir the egg white into the granola. 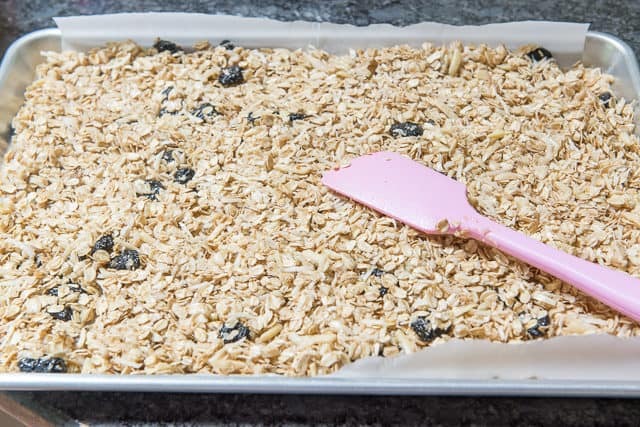 Spread the granola onto a parchment paper-lined sheet pan and bake for 40 minutes. If you would like a looser, more evenly toasted granola, stir the granola halfway through baking. 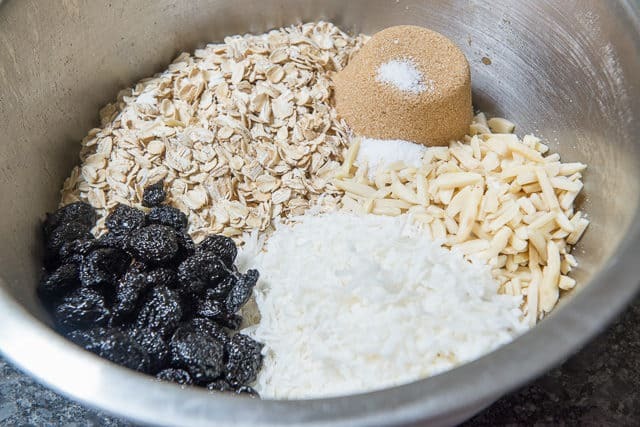 For more clusters, leave the granola to bake for 40 minutes undisturbed. 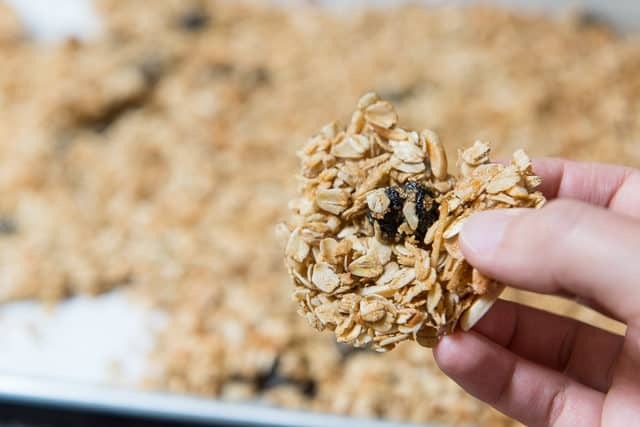 Let the granola cool completely on the pan, then break into clusters. Enjoy! *For gluten-free, make sure to buy gluten-free oats. **I use olive oil and don't find it to have a noticeable flavor, but you can use any other oil you prefer, like coconut, sunflower, canola, etc. Post updated with photos, writing, tips, and recipe in August 2018. Originally published January 2012. I love how fresh this is! So much better than buying a bag of who know how old granola is from the store. I could eat this on yogurt or just as a snack every day! We seriously eat granola every morning on our yogurt parfaits. Great recipe! I just made up a batch. I’m using a smaller rectangular pan and it looks like I might get 3 panfuls of granola. 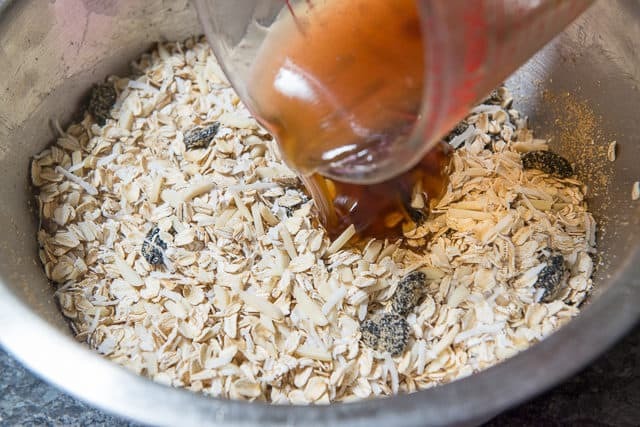 I added a capful of vanilla to the warm oil and maple syrup and cinnamon to the oat mixture. It is baking and the kitchen smells so good! I made this granola so I can use it for my Açaí Bowks. Thank you for this great recipe!